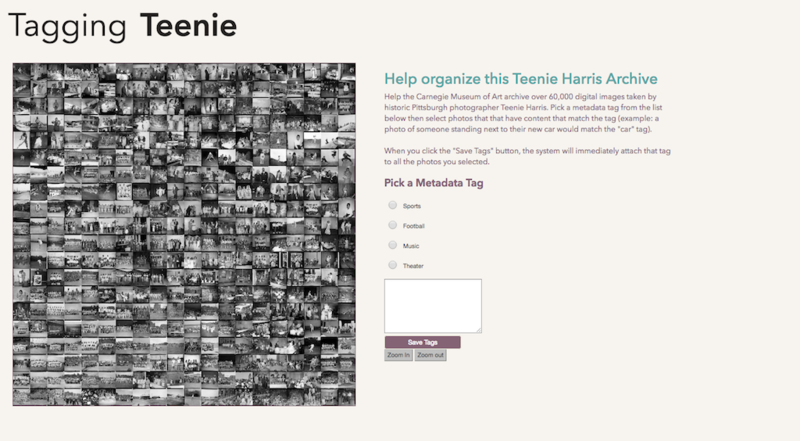 Tagging Teenie is a tool to help the Carnegie Museum of Art add metadata tags to their database of images taken by historic Pittsburgh photographer Teenie Harris. The database contains over 60,000 digital images and serves as one of the most detailed records of the African American urban experience during the 20th century. The interface displayed features a TSNE grid, which takes in a large set of images (between 100 and 1,000) and displays them in a grid that allows users to select multiple images then add metadata tags to all of them all in one click. I started this as part of our large image database assignment and continued it as my final project to see how the TSNE grid could be used for photo identification. To get the grids, I used Aman Tiwari’s fork of Gene Kogan’s original ofxTSNE code. In this fork, Aman added the ability to output the coordinates of the image locations within the grid as a JSON file. The interface is built on top of the image created by the OF addon. By mapping the location of the clicks back to the coordinates in the JSON file, I am able to get the name of the image that is being clicked. I am currently still working on attaching these image ID’s to the tag that the user chooses. I iterated through multiple TSNE grids to figure out the best number of images to use within the grid so as to maximize visibility without minimizing clustering. Then settled upon 400 since this started revealing clusters of similar images (this one shows a cluster of sports teams in the bottom left and a cluster of musicians in the upper right). However, it was still a small enough set of images that it didn’t feel overwhelming to scroll around. The specific use case for the screen pictured above and in the video below is part of a multi-step system that the museum could use to recruit more volunteers to interact with the Teenie Harris archival project. 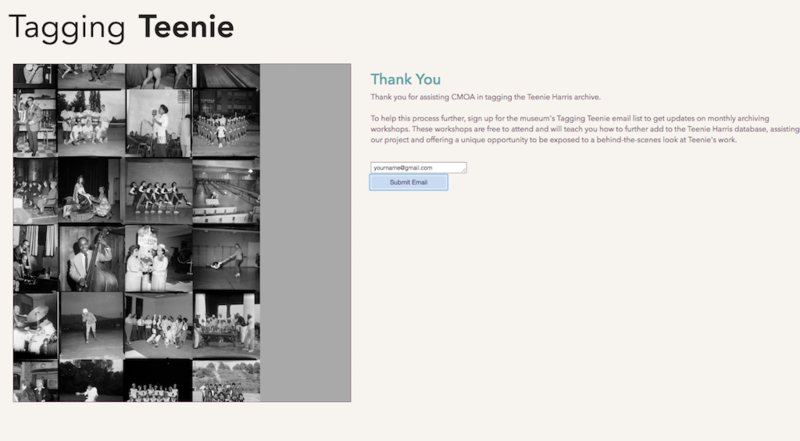 Step 1: Visit Teenie Harris exhibit at CMOA, view touchscreen display with Tagging Teenie interface (shown in this documentation). Step 2: Spend a few minutes tagging photos for the database. Step 3: Submit tags and view message asking for your email to get information about volunteering for database archiving workshops. Submit email address. Step 4: Get email about day-long workshop (on a Saturday, with lunch provided!) at the museum that will teach you how to operate a more advanced version of the interface and provide behind-the-scenes interaction with the Teenie Harris database. Sign up for workshop. Step 5: Attend workshop. Learn how to create your own tags and scroll through larger grids (up to 1000 photos each). Teenie-ScreenDemo from Paige Pritchard on Vimeo. I met with David Newbury and Louise Lippincott from CMOA to get their feedback on how this project could be useful for the museum. They liked the layout and the ability to display so many photos in a clean interface. Instead of having users choose from specified tags or adding their own, it would be more interesting to Louise to have choices such as “I know this person”, “I know this place” or “I know something about this photo”. The ability to let people pick out photos that they know something about then give the museum their contact information via the email box would help bridge the gap the museum currently has in connecting the photos to the stories people know about them. I could create even more TSNE grids for the workshops and have people add metadata tags that are aligned with the subject taggings the museum uses across their databases (which follows the Library of Congress subject taggings). With more grids, I could add a “give me new grid” option where users could pick what subject of a grid they wanted to see. So if they know something about the sports images Teenie took, they could request a sports-related grid to analyze. I could use Leaflet to add a popup on the photo once it’s clicked showing the existing metadata about the photo and providing a link to it on the website. This could be a useful tool in showing to community members they know have a connection to the Teenie Harris database. For example, they could have a musician they know was photographed by Teenie sit down and scroll through all the TSNE’s with musical performances in them and quickly identify images. This interface could appear in multiple locations – as a touchscreen in the CMOA exhibit to let people explore many photos in one glance, as a tool for workshops and museum archivists, and as an element of the website so that it could be sent out to members of the Pittsburgh diaspora who are unable to physically come into the museum but might have stories to share about photos if they’re able to quickly scan and identify them remotely. Many of these suggestions are similar to my own plans for taking this project further. I was excited to get the feedback about changing the tags to ask users if they know information about photos, I feel like this is an even more useful way to connect the photos to the stories they tell. Figure out how to overlay a highlight on a photo to show users they’ve picked it. Tell users how many photos they’ve tagged after submitting the tags. Write the algorithm to grab the photo ID’s from the JSON file and attach the tags to the ID’s. I plan to make these updates to the project over the next two weeks. The updated code will be on my Github. Here is the Github link to this current iteration.